Growing up, I was an outdoor kid, always playing some form of sport requiring a ball and competition. Usually the games involved me pummeling my best friend, Adam, who was almost a foot shorter than I was; we bounced from basketball to baseball on the front lawn to one-on-one touch football. Occasionally he’d sneak a win, but usually the outcome was a forgone conclusion. Unless it rained… When the weather turned sour, we’d head inside to pursue our other passions: Tecmo Super Bowl (which later evolved into Madden,) and Monopoly. It was on the Monopoly board that Adam exacted revenge. It’s funny to think about someone being “good” at Monopoly, a game hinged on the roll of dice, but Adam is. (There’s more math and strategy involved than I ever thought about.) While I was chasing hotels on Boardwalk and Park Place, Adam would quietly be amassing properties on the “free parking” corner: the orange and red squares. Nearly every time we played, he would broker a deal to send Park Place to me in exchange for Illinois Avenue with St. James thrown in; and every time, I would bite, chasing the upside potential of the most expensive properties on the board. Recently, we were reminiscing, and I mentioned those trades and how he would always manage to squeeze every last dollar out of me during our marathon Monopoly battles. Mind blown. He was using undervalued, high-floor properties to destroy me while I waited for the big score than never came. Devante Parker is currently akin to a 2018 first round pick. (No really, there have been multiple recent Twitter polls reaching that very conclusion.) His startup ADP currently sits at 52 overall. Sure, Parker was a top fifteen pick in 2015, and he’s only 24 years old. It’s true he is 6’3” and runs a 4.45 forty-yard dash. According to PlayerProfiler, Parker’s best comparable player is A.J. Green. I can’t dispute Parker’s potential. It’s pretty apparent that he has the physical tools to be an elite NFL receiver. Parker led Louisville in touchdowns as a freshman and truly broke out as a sophomore, posting 40 catches for more than 700 yards and ten touchdowns. He appeared poised to be the Dolphins’ primary redzone target from day one; he hauled in five of his nine redzone targets in 2016 for four touchdowns. Last season, Parker was on the field for nearly 90% of Miami’s snaps, averaged 13.3 yards per reception, and rent is $1500 with a hotel. He is Park Place. Parker is the darling of the portion of the dynasty community valuing youth, upside, and “talent over everything.” He could be A.J. Green! But he’s not, and it’s unfair to expect a young receiver to be. In his first two seasons, Parker managed 1238 yards and seven touchdowns on 82 catches. (Not a horrendous start, although by comparison, it’s roughly half of the production A.J. Green put up in his first 31 games in Cincinnati.) 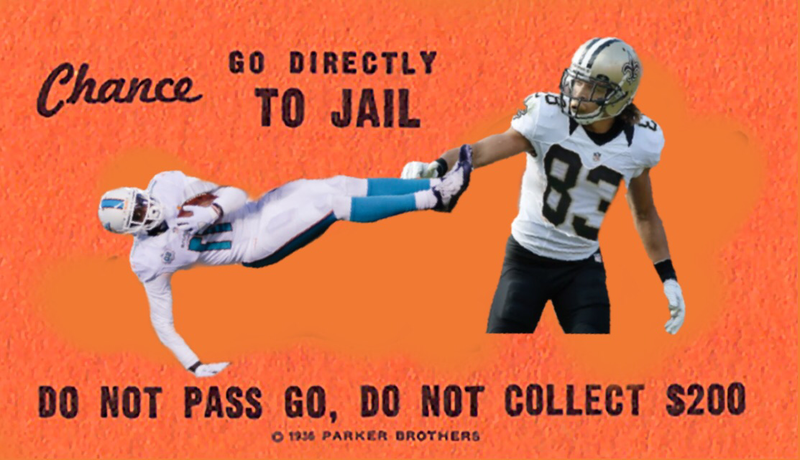 Whether it is Parker’s dismal situation in the NFL’s 31st ranked passing offense (by attempts,) his inability to separate himself from the likes of Jarvis Landry and Kenny Stills, or Parker’s oft-discussed lack of focus, something is holding him back from reaching the meteoric heights of his potential. 2016 promised Parker-truthers an increase in target share and a Gase-induced shift away from the conservative, Landry-centric offense toward more deep shots being taken by Tannehill. It should have been a perfect recipe for Parker to slip past Landry and Kenny Stills to assume his place atop the Miami passing attack. Except that while the Dolphins yards per pass attempt went up by half a yard, the total pass volume was cut by over 100 throws. Instead of a high flying, vertical offense, the Dolphins put the ball in the belly of Jay Ajayi and won 10 games for the first time since 2008. Parker still turned 87 targets in 744 yards (good for ppr WR50), but it’s hard to imagine much room for his role to expand moving forward. I expect Gase to build on the shoulders of that success and run more in 2017 if possible. Still not convinced? We’ll go pie-in-the-sky upside for Parker’s third year breakout: In a favorable bank error, the Dolphins front office offered Kenny Stills a four year, 32 million dollar contract (and immediately regretted it because Devante Parker is indeed going to stretch the field for the 2017 ‘Phins.) Parker, per reports, turns over a new leaf, showing up to meetings on time, even bringing an apple a day for his second-year coach. Gase reciprocates by increasing Tannehill’s targets to Parker by nearly 10%. Even with all of these unlikely dominoes falling into place, Parker’s ceiling is around 60 catches on 95 targets for 915 yards and 7 touchdowns. That’s 192 points in a PPR format; or .5 points more than Willie Snead produced in 2016. Willie Snead is unassuming, undrafted, and undervalued. The 24 year old has produced in a big way as the tertiary option in the potent Saints offense, putting up at least 895 yards in each of his first two seasons. Snead’s metrics may be pedestrian, but he manages to get open often. (It’s a delicious irony that Snead’s closest comparable on PlayerProfiler is Jarvis Landry, another metric flop who has assumed the mantle of lead dog in Miami.) Snead is Illinois Avenue; when you pick him up off the board on a late turn (at a June startup ADP of 55,) nobody notices, but his unostentatious consistency is a game winner. Part of what made Michael Thomas such an enticing prospect last year was the fact that he landed in New Orleans. Any player in the Big Easy benefits; kind of an “all sails catch the Brees” effect. As the third option in 2016, Willie Snead saw 104 balls thrown his way. This volume alone makes him a candidate for decent production. Throw in Snead’s nearly 70% career catch rate, and you’ve got a recipe for putting up points. With Brandin Cooks departing for New England, Willie Snead appears poised for a third-year breakout of his own. The Saints have added veteran nine route specialist Ted Ginn, but it’s not a huge leap to see Snead jump up to second on the pecking order for targets. (While it isn’t a huge role expansion for Snead, I could easily see him picking up ten targets.) If that happens, Snead could conceivably be somewhere in the neighborhood of 81 catches for 1,030 yards and five scores for his ceiling. When you take Snead in the middle of the fifth round instead of Parker, you’re getting a potential top 20 wideout, a WR3 floor, and the peace of mind that he will see the volume needed to return consistent production. 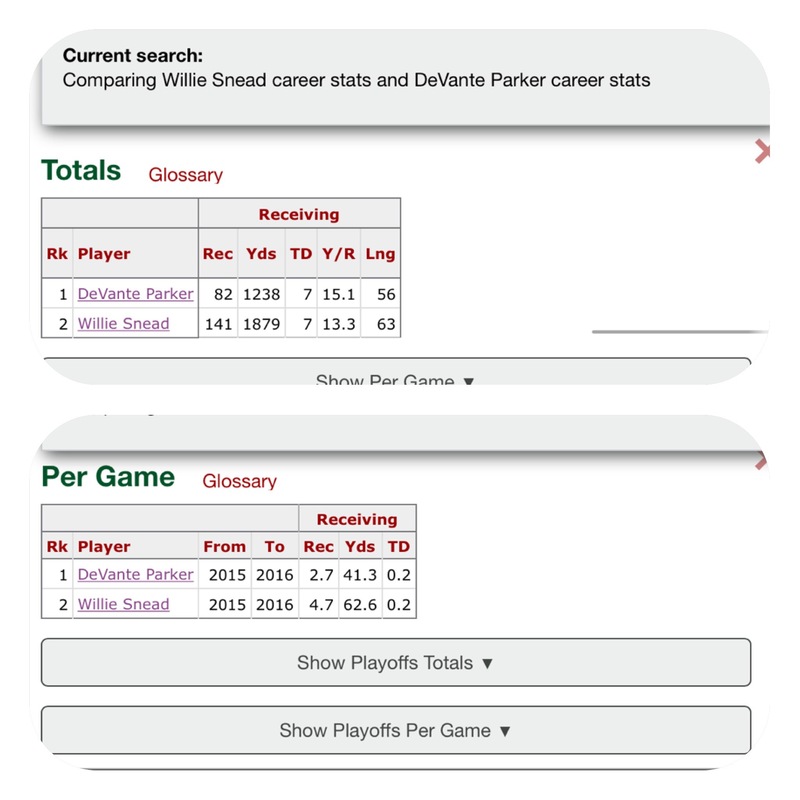 Parker has the hype, but Willie Snead pays the rent.